Gene is beautiful! 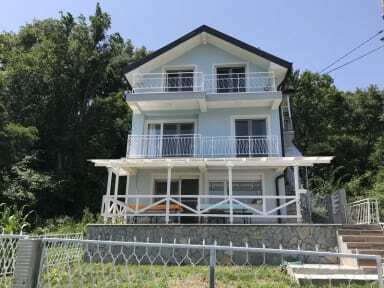 And the hostel too! Bikes. kayaks, boats, what is next? A yacht! 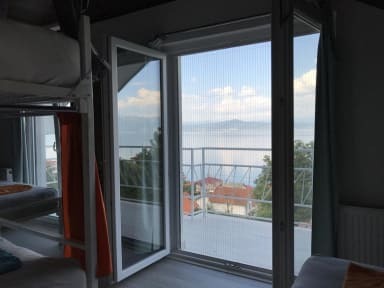 One of the best hostels I have ever stayed in - the perfect place for a relaxing stay with incredible views of Lake Ohrid. The host Gene is amazing and picked me up from the airport and gave me amazing tips and help on what to do which I never would have found without him. Hostel itself had great facilities and VERY comfy beds couldn't fault it (shout-out to the homemade banana bread for breakie). All in all I had an amazing time and look forward to returning in the summer. Thank you FreeFlow! Gene is a great host and the location is perfect. The scenery is beautiful and the village is still close to Ohrid where you can go out if you want to. Next time I visit I will make sure to stay longer! This place is absolutely a gem. Brand new hostel just opened 2 months ago by the American Gene who does everything to make your stay the best one ever. Together with Bobo they form a great staff. This place is just what I needed during my trip, peaceful but fun. Everything was super clean and the breakfast is great. I also went hiking for a day with Bobo which brought me to places I would have never found on my own. Cheers guys, keep it up! Everything was great, the furniture is new, the staff is helpful and cool, the breakfast is nice and filling. The lake and a store is at a convenient distance. I had a perfect weekend at FreeFlow Hostel! The view from the hostel is beautiful and if you search a place to relax I highly recommend you to stay at FreeFlow. I loved the banana bread you get for breakfast (homemade and fresh). A little slice of paradise! The accommodation was clean and had every amenity I could need. the location gave me a chance to clear my head after traveling, but was still close enough to Ohrid city to get a taste of the nightlife. The lake is beautiful and there is so much history around. Personally though, the best part was the food! Gene is a flavor wizard, and the little fish restaurant in the village was fantastic. My next trip to FreeFlow is going to be very soon. I arrived having booked 2 nights and immediately extended to 4, I wish I could have stayed longer, so hard to leave! Beautiful location on the lake, perfect spot to relax when travelling. In a smaller village but can easily catch the bus to Struga or Ohrid for the day. Gene was a great host, cooked dinners for us all and drove me to/from bus stations. Great breakfast too, homemade banana bread, fruit, eggs etc. Will be back! !